On the latest episode of the R2C2 podcast, Aaron Judge said he’s probably done with the Home Run Derby. “I think I am one and done,” he said, specifically. 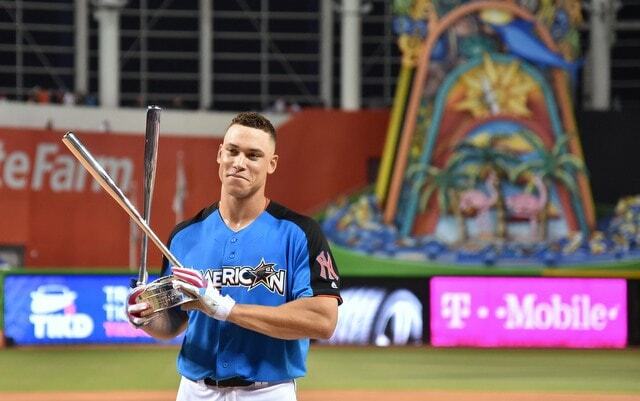 I thought he was joking around when I heard it on the podcast, but today in Tampa, Judge doubled down and told reporters he’s probably not going to participate in the Home Run Derby again. Judge won the Home Run Derby last season before slipping into a second half slump, which of course plenty of folks blamed on the Home Run Derby. Why does no one credit the Home Run Derby when something good happens? Maybe it helped Giancarlo Stanton hit those 27 homers in his first 49 games after the break. So weird how we only focus on the negative. Anyway, Judge said he’d “rather not say” whether the Home Run Derby contributed to his shoulder injury and second half slump. Earlier this spring he said the shoulder issue first popped up after crashing into the wall making a catch at some point before the All-Star break, though I suppose the Home Run Derby could’ve exacerbated things. Also, on the podcast, Judge talked about the All-Star break not feeling like a break last season. The Yankees played Sunday, there was media day and the Home Run Derby on Monday, the All-Star Game on Tuesday, and then really only one day off before rejoining the team. I imagine that factored into Judge’s decision to skip the Home Run Derby going forward. I am pro dingers so this news is a bummer to me. I was hoping to at least see Judge defend his title this season. Then again, the Yankees have two other Home Run Derby candidates on the roster, maybe four if Greg Bird stays healthy, so no Judge probably won’t be a big deal. Still would’ve been fun to see the big guy take his hacks again though.